Our latest podcast features Stephen Brook, author of the newly released The Finest Wines of California: A Regional Guide to the Best Producers and Their Wines. A regular writer for Decanter and The World of Fine Wine, and the author of fifteen books on wine, Brook is in demand as an international wine judge. Despite being a committed lover of European wines who “worships at the shrine of terroir,” Brook is passionate about California wine, and explains why in this podcast. He even busts the myth that California’s wine regions don’t have strong terroir, describing the climatic factors that typically give California wines their generosity of flavor and fruit. Brook goes on to discuss some stereotypes about California wines, how he assesses vintages, and several areas beyond Sonoma and Napa you’ll want to pay attention to, including Santa Barbara, Paso Robles, and the Sonoma Coast. Named Wine Publisher of the Year in 2010 by Gourmand, UC Press offers books that speak to nearly every aspect of wine culture. 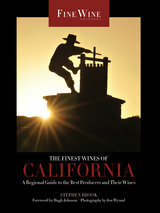 The Finest Wines of California is the fourth book in our series of authoritative “field guides” to the world’s most important wine regions by the experts behind The World of Fine Wine magazine. Check out our award-winning guides to Bordeaux, Tuscany and Central Italy, and Champagne. Stay up to date with the UC Press Podcast through iTunes or RSS. You can also listen to individual author interviews at our podcast page.